This section explains the flow of information between the client and Amazon Lex for each user input, including the integration of the Lambda function. The section assumes that the client sends requests to Amazon Lex using the PostText runtime API and shows request and response details accordingly. For an example of the information flow between the client and Amazon Lex in which client uses the PostContent API, see Step 2a (Optional): Review the Details of the Spoken Information Flow (Console) . For more information about the PostText runtime API and additional details on the requests and responses shown in the following steps, see PostText. User: I would like to order some flowers. Request URI – Provides bot name (OrderFlowers), bot alias ($LATEST), and user name (a random string identifying the user). The trailing text indicates that it is a PostText API request (and not PostContent). Request body – Includes the user input (inputText) and empty sessionAttributes. When the client makes the first request, there are no session attributes. The Lambda function initiates them later. For more information, see Input Event Format. messageVersion – Currently Amazon Lex supports only the 1.0 version. invocationSource – Indicates the purpose of Lambda function invocation. In this case, it is to perform user data initialization and validation. At this time, Amazon Lex knows that the user has not provided all the slot data to fulfill the intent. currentIntent information with all of the slot values set to null. For information about the response format, see Response Format. dialogAction.type – By setting this value to Delegate, Lambda function delegates the responsibility of deciding the next course of action to Amazon Lex. If Lambda function detects anything in the user data validation, it instructs Amazon Lex what to do next, as shown in the next few steps. The client displays the message in the response. In the request body, the inputText provides user input. The sessionAttributes remains empty. invocationSource – continues to be DialogCodeHook (we are simply validating user data). 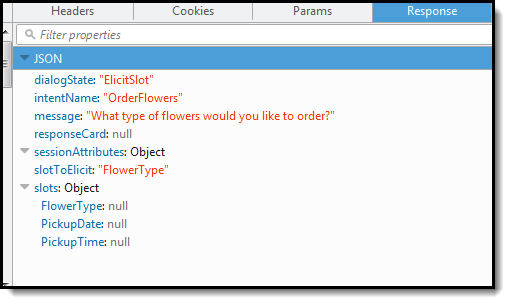 currentIntent.slots – Amazon Lex has updated the FlowerType slot to roses. According to the invocationSource value of DialogCodeHook, the Lambda function performs user data validation. 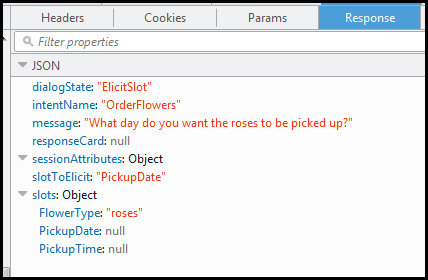 It recognizes roses as a valid slot value (and sets Price as a session attribute) and returns the following response to Amazon Lex. sessionAttributes – Lambda function has added Price (of the roses) as a session attribute. dialogAction.type – is set to Delegate. The user data was valid so the Lambda function directs Amazon Lex to choose the next course of action. The client simply displays the message in the response – "What day do you want the roses to be picked up?." In the request body, inputText provides user input and the client passes the session attributes back to the service. Amazon Lex has updated the currentIntent.slots by setting the PickupDate value. Also note that the service passes the sessionAttributes as it is to the Lambda function. dialogAction.type – is set to Delegate. The user data was valid, and the Lambda function directs Amazon Lex to choose the next course of action. 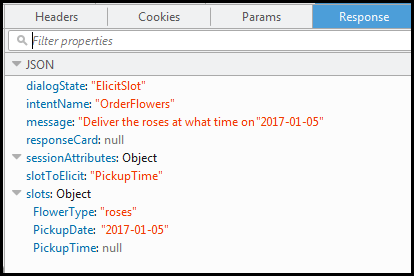 The client displays the message in the response – "Deliver the roses at what time on 2017-01-01?" In the request body, inputText provides user input. The client passes the sessionAttributes in the request. Amazon Lex has updated the currentIntent.slots by setting the PickupTime value. According to the invocationSource value of DialogCodeHook, the Lambda function performs user data validation. It recognizes PickupDate slot value is valid and returns the following response to Amazon Lex. sessionAttributes – No change in session attribute. The client simply displays the message in the response and waits for the user response. Amazon Lex interprets the inputText in the context of confirming the current intent. Amazon Lex understands that the user wants to proceed with the order. This time Amazon Lex invokes the Lambda function to fulfill the intent by sending the following event, which sets the invocationSource to FulfillmentCodeHook in the event it sends to the Lambda function. Amazon Lex also sets the confirmationStatus to Confirmed. invocationSource – This time Amazon Lex set this value to FulfillmentCodeHook, directing the Lambda function to fulfill the intent. confirmationStatus – is set to Confirmed. "content": "Thanks, your order for roses has been placed and will be ready for pickup by 16:00 on 2017-01-05"
Sets the dialogAction.type – The Lambda function sets this value to Close, directing Amazon Lex to not expect a user response. dialogAction.fulfillmentState – is set to Fulfilled and includes an appropriate message to convey to the user. Amazon Lex reviews the fulfillmentState and sends the following response back to the client. dialogState – Amazon Lex sets this value to fulfilled. message – is the same message that the Lambda function provided. The client displays the message. Jasmine as the flower type (it is not one of the supported flower types). Yesterday as the day when you want to pick up the flowers. After placing your order, enter another flower type instead of replying "yes" to confirm the order. In response, the Lambda function updates the Price in the session attribute, keeping a running total of flower orders. The Lambda function also performs the fulfillment activity.